Like that return to the Source. Behold the mystical letters: Alif Lam Mim. 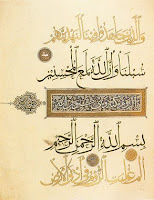 This (Quran) is the Scripture; in it is guidance sure.
. what does the word Quran mean? The word Quran is derived from the root 'to read' or 'to recite', hence Quran (also written as Koran, Qur'an) is a verbal noun meaning reading or reciting.